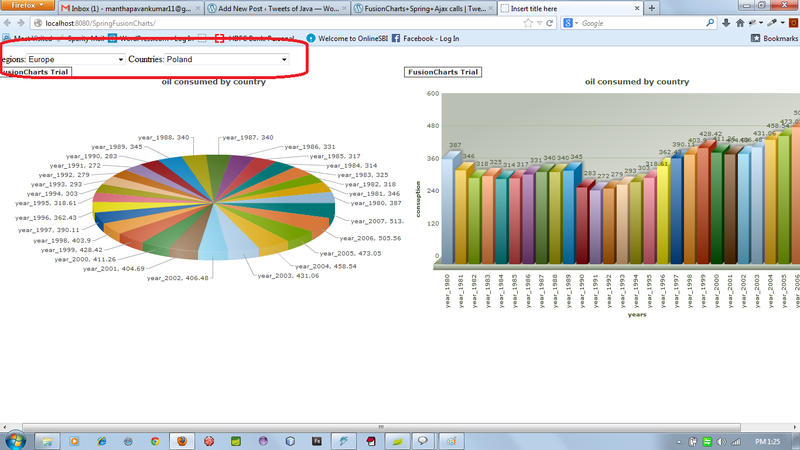 Hello all, in this post i am going to take you on a tour how to render fusion charts data dynamically. In my previous post i explained rendering data statically. Here i explain how to make Ajax calls, using ajax we are going to populate region,country. Based on the region and country we get the oilConsumedByCountry by year and change this data based on the country changed, and create a dashboard which displays “Pie and Bar” charts. Following is the script for creating db table. lets have a look at configuration files applicationContext.xml,spring-context.xml,hibernate-cfg.xml,web.xml respectively. This controller calls the DAO layes to fetch the data required by client and converts it to JSON format and returns it back to client. // Generate Getters and Setters.. 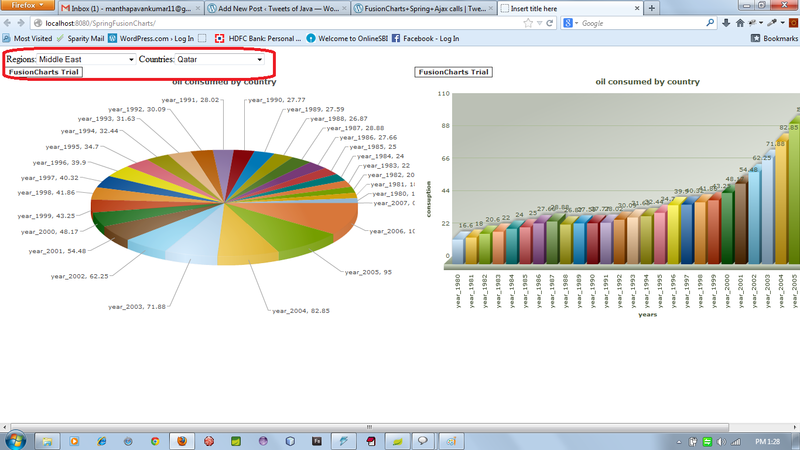 This is the JSP file used as view, data from controller is rendered here using a jquery script. After changing the region and country the data changes dynamically. WOW its a great manual, however I have a big doubt. How can I do that but using Gson instead of JSONObject, JSONArray and JSONSerializer??? Is there any example??? put console.log() before “myBarChart.setJSONData(dataStr);” in java script and check if you have json data available for rendering, i mean the json got returned from Spring to Ajax client. use Firebug to debug the ajax calls. If possible please send me the screens of the ajax calls from firebug.